Swan Falls Dam will be the host of our last overnight camp. The dam was built in 1901 to provide electricity to nearby mining towns and was the first of its kind on the Snake River. Prior to the construction of the dam, steam served as the power source for the mining operations. However, with many successful hydropower projects occurring in the US at the time, such as the Niagra Falls to Buffalo project, the Trade Dollar Consolidated mining company believed the Snake River would be an ideal source of energy and power. The current power plant is owned and operated by Idaho Power and continues to provide electricity for the entire Boise Valley. 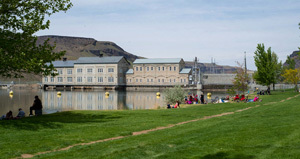 Swan Falls Dam lies within the world-famous Snake River Birds of Prey National Conservation Area. The area is home to many bird species such as owls, hawks, eagles, and falcons. As a highlight for our afternoon in the park, we will have volunteers from The World Center for Birds of Prey share with us their enthusiasm for the raptors. 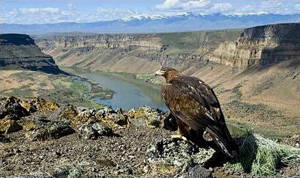 There will be an hour-long presentation about the birds of prey of SW Idaho and about raptor conservation in general (peregrine and condor recoveries and global projects of The Peregrine Fund), this will be followed by a demonstration showcasing live raptors. 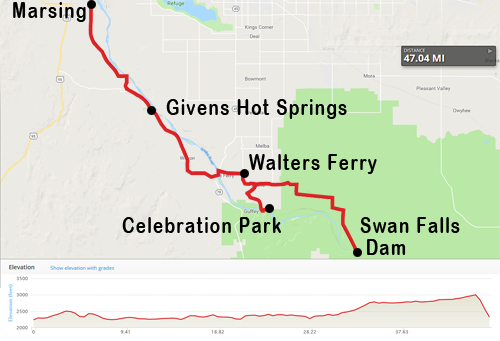 We will be camping at the Swan Falls Recreation Area, a large park situated on the South side of the Snake River and filled with ample opportunities for recreation such as fishing, hiking around the network of footpaths, and bird watching! The tranquility of the Snake River will provide the perfect backdrop for our last night! Tonight’s camp is in a beautiful remote Snake River Canyon setting, which is 30 miles from the nearest motel. If it is absolutely necessary that you have indoor comfort’s, we will get you to a destination, or if we can convince you that this could be one of the greatest under the star’s camping experiences you have ever had, let’s make it happen. You can bring camping equipment for this one night, or the “Good Grief Tent and Porter Service” has agreed to provide a single night service for those interested. Watching the sun set against the canyon walls and listening to blue grass music in this beautiful remote setting will more than fill the lack of comfort you may have sacrificed.